We can design and print your magnets directly to your door step. 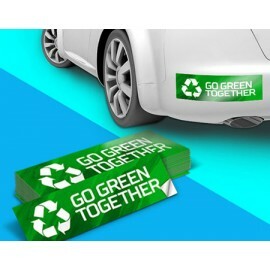 Car and truck door magnets are a very cost effective way to advertise your business as you travel. Made out of our durable 15 mil or 30 mil thick magnetic material they are easily removable and you can choose rounded corners to help prevent your sign from lifting or flying off driving at high speed. If you are considering buying car door magnets for your entire fleet, give us a call and ask about our volume discount. Jtuck Industries apply's the industry standard in the United States for car magnets, you won't find a better company anywhere. All of our magnetic signs for cars are printed with the latest high resolution up to 1440 DPI, digital print technology on high quality iron ferrite(magnetic) material with a clear back coating to protect your vehicle's paint. Vibrant color UV or solvent inks are printed directly on to the magnetic material surface creating long lasting color that will not fade for years to come. We also verify your custom design several times throughout the production process to ensure you are getting the exact design you paid for. Our magnetic signs will last for years, so it’s a very low cost per impression when it comes to advertising. Installation and Maintenance for your magnets. Your custom magnetic car sign will be shipped rolled to avoid damage while in transit via USPS or FedEx®. Straighten your magnet on a flat metallic surface (like a refrigerator) for at least 3 hours to return it to its original shape before applying to your vehicle. Be sure to clean your car or truck surface thoroughly before placing your magnetic signs on them. Regularly remove your magnets from your auto and clean under the magnet, as well as the surrounding area. Most of our customers generally do this each time they wash their car. Always store your magnetic sign on a flat surface when not in use.